After I had played in London I went to Newcastle to perform there. I got a very, very kind and warm reception, for everyone knew I was a Newcastle girl. At the end of my performance a working man stood up and said, "I think Miss Hall should have a new violin. I have just made one and intend to give it to her." The Amati evidently did not strike him as being a good one. A few years ago I got a very bad attack of typhoid, but, thanks to the efforts of several doctors and nurses, I pulled through all right, though my life was absolutely despaired of at the time. Of course this illness interfered with my work and for nearly a year I could do nothing. When I recovered I did a big tour in America and visited New York, Boston, Washington and many other towns. I had to do, as may readily be imagined, a great deal of travelling to keep all my engagements, which amounted to sixty concerts in all, at places hundreds and hundreds of miles from each other. Trains in America are still sometimes "held up" by gangs of train robbers, and with generally unpleasant results to the passengers who have got anything valuable about them. One day I was about to start on a journey with my manager, and at the time we had with us a considerable sum of money in "greenbacks" and bank drafts, so that we should have been a very valuable catch to a "holding up" party. Now, at the last moment, we decided to go by another train, and shortly afterwards learnt that our original train had been "held up" and completely rifled. I enjoyed my tour in America and Canada immensely. At Ottawa I stayed at Government House with Lord and Lady Grey, who were very kind to me, but I was not sorry when the time came for my return home, for truth to say, I was getting rather homesick, and I am very, very fond of England. I was interviewed a good deal in the American Press, and though I had heard something of the lively imagination of the American journalist, I had no idea how lively it really was until I saw some of my opinions on subjects on which I had expressed no opinion whatsoever appearing in the columns of different American papers, and in addition to these "opinions" I found myself relating in print the most weird and wonderful anecdotes of my career, which I must say did credit to the imagination of the writer if not to his veracity. However, in America one soon gets accustomed to that sort of thing. I wonder though why American Press people go to the trouble of interviewing at all when they can write such wonderful interviews from their imagination. I have done, of course, a great deal of touring in this country, and have had the pleasure of playing at Buckingham Palace. I have played at innumerable "at homes," and once had a rather funny experience when performing at one of these social entertainments. When I finished playing Bach's very well known Chaconne, a lady came up to thank me, and with great impressment said, "You do play Bach divinely - Can you play his Chaconne - it is my favourite piece?" I said "Yes," and nothing more, for what more was there to be said? I overheard once a really amusing little bit of conversation between two ladies at an "at home," that was indirectly connected with my playing. I had finished playing and was talking to the hostess when the conversation I allude to arose. It was mainly concerning the love affairs of a certain "young couple" whom both ladies were apparently much interested in. "He has taken her downstairs to tea," said one of the ladies, "and I should not be in the least surprised if he has proposed to her." "I should not be a bit surprised if he had," said the other, and then added thoughtfully, "I can hardly understand how a man can sit next a girl he cares about when Miss Hall is playing the violin and not propose to her." I wonder if I really have been responsible for any engagements. 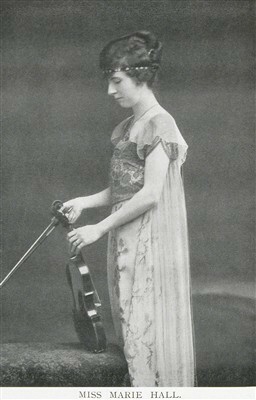 It is rather a dreadful thought, for certainly if my playing had any such effect it would add immensely to my responsibilities as a violinist. I have sufficient as it is. I see a very large pile of correspondence that I must get through somehow; I hear my telephone tinkling, tinkling, and my maid has come to tell me that several people I have made appointments to see are waiting for me. So I must bid my readers a kind adieu and trust I may have interested them for a little while. Oh, she is such an entertaining writer; I have no doubts about her playing! Fascinating musician. Thanks for sharing her writings. Speaking of female Brit musicians, you might be interested in the pianist Myra Hess (http://en.wikipedia.org/wiki/Myra_Hess). She was a terrific pianist who achieved particular fame for her concerts in London during and after the Blitz in WWII. My father heard her several times during the period when he was in London in WWII at these concerts and wrote very excited letters to his parents about hearing her. She is so fun! I am getting addicted to these, thank you for posting! Emily, your entertaining blog inspired me to reread the chapter on Marie Hall in Tony Faber's "Stradivari's Genius". His chapter was so dry and shallow in comparison. He obviously hadn't written Marie Hall's own words. A pity.